This is the peak season for savoring sweet persimmons and Miaoli County Government is cooperating for the first time with three towns--Taian, Dahu and Nanchuang--to host Miaoli County Persimmon Season events, currently taking place until December 31. Persimmons are a Miaoli specialty and organizers hope to use the fruit to connect residents and tourist to the county's culture. At the "Autumn Persimmons" event, juicy persimmons can be enjoyed in the three towns, in addition to persimmon-eating contests and other fun activities. Agriculture-rich Miaoli features not only abundant farm produce but also a colorful history and culture, including Aboriginal tribes in the area. Famous large-scale events providing rich cultural experiences from one town to the next include the Atayal Tribe Harvest Festival, the Saisiat Pas-Ta'ai festival (aka the Saisiat "Short Spirit Festival") and the Hakka Harvest Festival. Persimmons from the Taian area are mostly grown at higher elevations, in the shadow of the high mountains. The easiest way to find them is a short drive to the Nasamagu (Giwas) Fruit Garden. Giwas Guest House, located at an elevation of 860 meters, cultivates its own persimmons, rated with a sweetness category of 23, indicating sweet, juicy and fairly crunchy fruit. The son of owner Zheng Ming-chun guides visitors through the fruit orchard and on to breath-takingly beautiful, panoramic mountain views. 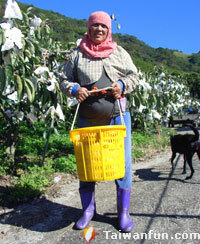 While most orchards do not allow visitors to pick high-end persimmons, Giwas offers this experience. 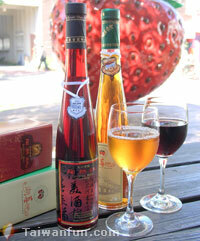 Besides persimmons and fresh strawberry picking, Dahu township features wine tasting at its local wineries. The Dahu Wineland Resort, once an old barn, has been transformed into a five-floor establishment offering visitors great strawberry tours. This "strawberry museum" sells strawberry-themed meal sets and beverages, and allows guests to observe the wine-making process. The local farmers' association recommends that visitors take a few bottles home, including the slightly-sweet, 11% alcohol Lake Berry Liquor. Other items for sale include strawberry soy beans and strawberry-flavored fermented bean curd, hard-boiled eggs and sausages. 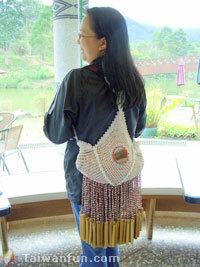 Nanchuang, home to the Atayal and Saisiat tribes, is rich in culture and beauty. The annual Pas-Ta'ai Festival draws tourists from near and far to enjoy sacred festivities, which include lots of dancing. Also recommended is a visit to the Saisiat Lakeshore Dyeing & Weaving Workshop, located in Donghe Village, which offers a rich range of beautiful Saisiat woven artwork for sale. Left: The "Buttocks Bell" is a special musical instrument used at the Pas-Ta' ai festival (aka "short Spirit Festival"), and is said to ward away evil spirits. Fruit-picking prices: Adult admission is NT$150, children are free. The permissons you pick are priced by weight (NT$100 per 0.6 kg). Hot springs start at NT$300. From now to Dec. 31, 2009, enjoy a special accommodation package for two, including Japanese meal sets, hot springs and 1 night's stay for only NT$3,900. Stay for one night or more to enjoy free access to the hot springs facility. 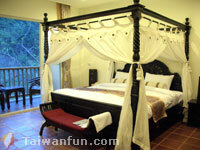 Hot springs package vouchers are also sold for NT$450 each (including pool usage and afternoon tea meals). 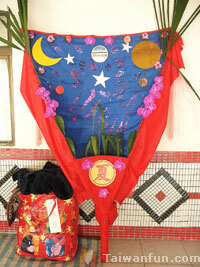 Basic hot springs vouchers are NT$300 each. Popular meal set choices at Spendtime Coffee include Duck Leg Confit (NT$450), Roasted Shrimp with Squid & Rice (NT$750), French-style Beef with Red Wine Sauce (NT$500) and Strawberry Roasted Pork Ribs (NT$450). Taiwan Fun Magazine is required by government regulations to remind you not to drink and drive.